Caprese salad is known for its display of the Italian flag’s colours, with its red tomatoes, green basil & fresh mozzarella. 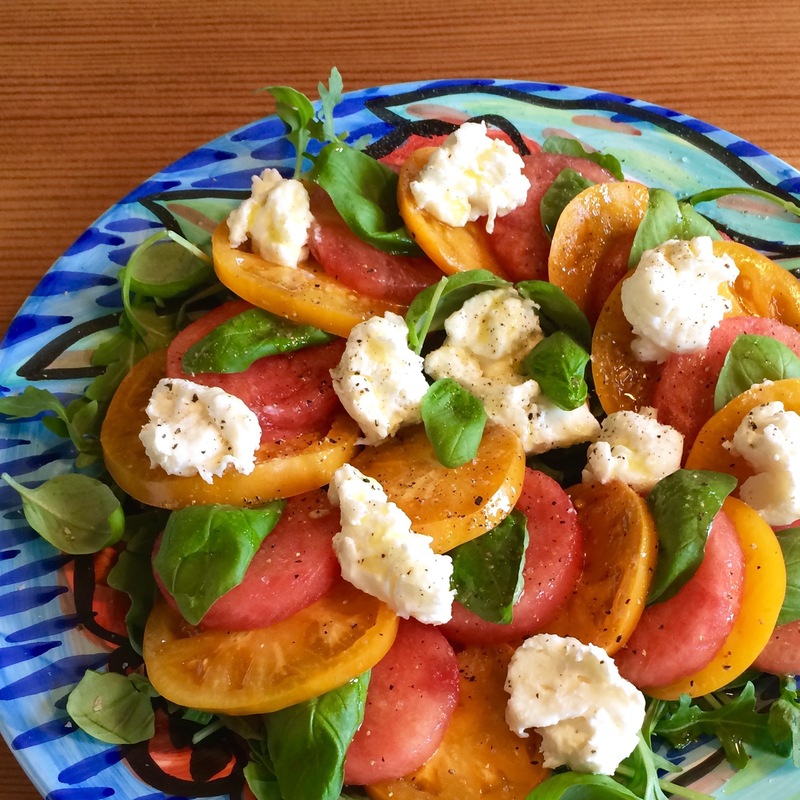 It’s is one of my all time favourite salads when the summer creates amazing tomatoes. We’ve been enjoying it over the last couple of summers using a buffalo Burrata instead of fresh Mozzarella. This summer I started playing with the idea of switching out the mozzarella with another vegetable or fruit. 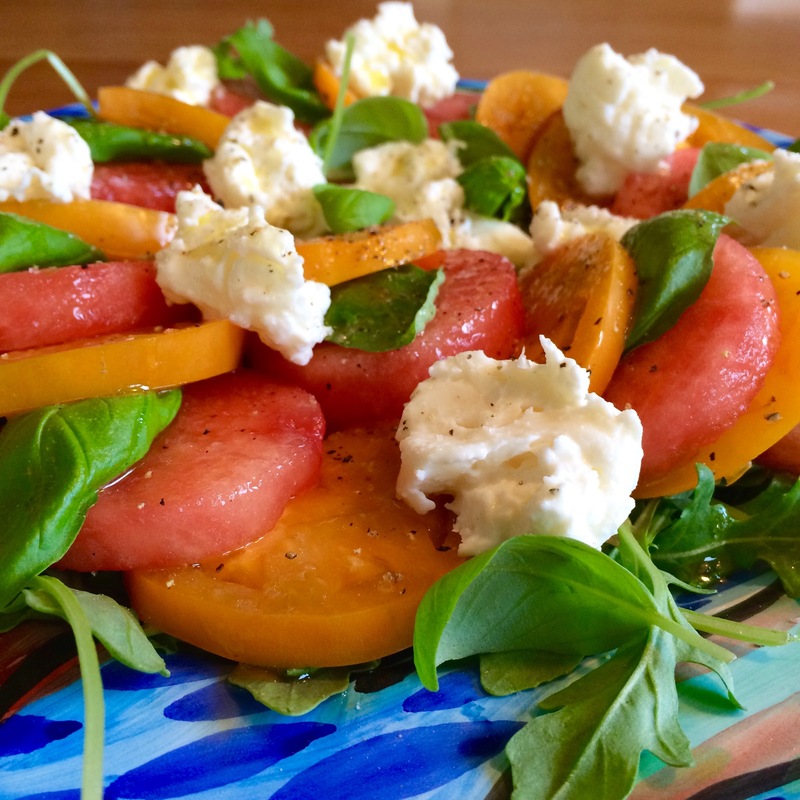 Using thinly sliced watermelon in place of the white cheese, makes a delectable, fresh & summery salad. When a bit of Burrata is scattered over the top, it becomes a great summer version of Caprese. I use yellow or orange beefsteak type tomatoes, with dense interiors that have lots of flesh (mesocarp) with many small seed pockets. These contrast beautifully with the pink watermelon, reminding me of summer sunsets. Slice the tomatoes into ⅜” slices, use the end slices for something else. Like eating while you’re making the salad. Cut the watermelon into ⅜” thick slices. 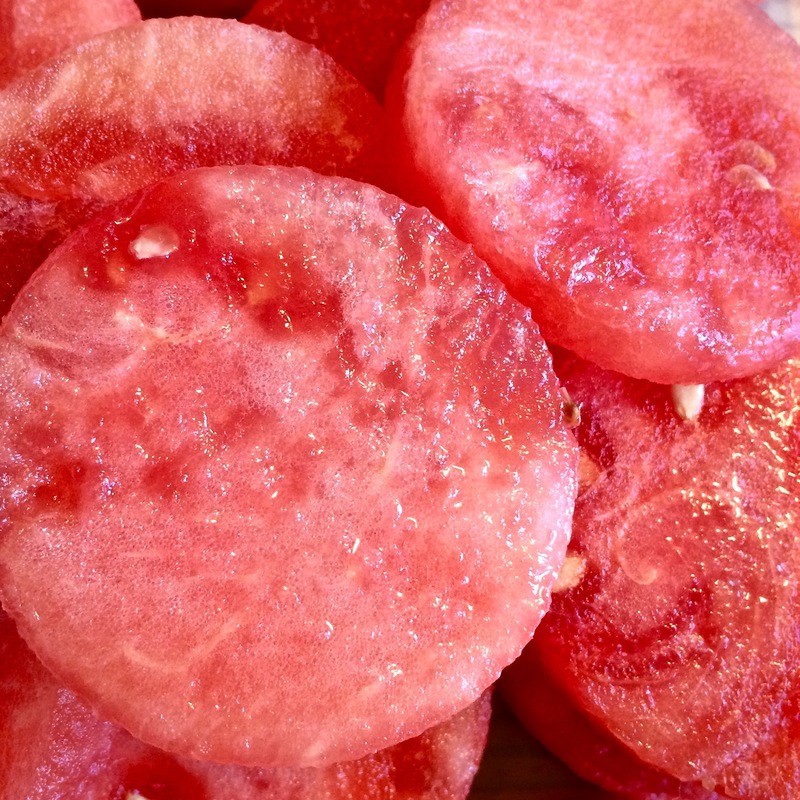 Using a round cutter, about the same size as the tomatoes, cut the watermelon into rounds. Lay a scattered layer of arugula over your serving plate (which can be the same size as a dinner plate). Alternate the tomato and watermelon slices in a spiral on top of the arugula, tucking a basil leaf in between every pair of watermelon and tomato slices. If you have any extra leaves, just scatter them around the edge. Put the vinegar and oil into a small drizzle bottle, cover the tip and shake vigorously. Lightly drizzle over the salad. Season with a light sprinkle of coarse salt, and some freshly ground pepper, and serve.